Incredibly tough, slightly stretchy spider silk is a lightweight, biodegradable wonder material with numerous potential biomedical applications. But although humans have been colonizing relatively placid silkworms for thousands of years, harvesting silk from territorial and sometimes cannibalistic spiders has proven impractical. Instead, labs hoping to harness spider silk's mechanical properties are using its molecular structure as a template for their own biomimetic silks. 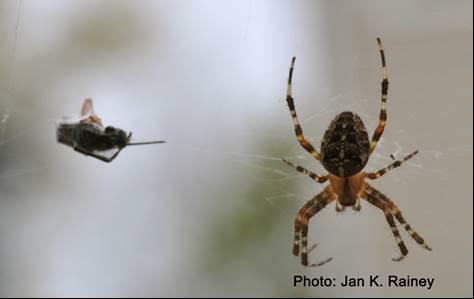 A team of researchers from Dalhousie University in Nova Scotia is focusing on the toughest of the spider's seven types of silk -- aciniform silk, used to wrap up prey that blunders into its web. Over the past few years, they have gradually unraveled its protein architecture and begun to understand the connection between its structure and function. They will present their latest findings at the 59th meeting of the Biophysical Society, held Feb. 7-11 in Baltimore, Md. The first step in creating artificial spider silk is to replicate the proteins that make up the natural version, in this case by recombinantly expressing them in E. coli. The key protein in aciniform silk, AcSp1, has three parts. Most of the protein is a repeated sequence of about two hundred amino acids. Two tails called the N- and C-terminal domains hang off each end of the protein chain. Jan Rainey's group at Dalhousie University used nuclear magnetic resonance (NMR) spectroscopy to analyze the structure of AcSp1's repeat sequence at very high resolution, producing one of the first spider silk repeat unit structure sequences to be reported. When they then linked more repeats together, they learned that the repeat units behaved in a modular fashion. That is, each one acted as an individual unit, instead of taking on new structure by being connected to other units. Such modularity has important consequences: it means that scientists trying to engineer artificial silk proteins can vary the length of the protein without sacrificing the entire protein's function. Plus, it means that researchers can focus on optimizing smaller, more manageable protein components before linking them together to form a large functional protein. The next step in creating artificial silk is to spin the proteins into long strands. Spiders have specialized equipment to accomplish this task, but finding the precise laboratory conditions that recreate this process is one of the biggest challenges of creating biomimetic silks. At least for the moment, spiders are more skillful spinners than humans. However, the researchers have found a clue to the fiber formation process in the c-terminal domain. They determined that although in some cases silk proteins can link into fibers without the c-terminal domain, the region in general helped with fiber formation -- fibers made of proteins with c-terminal domains tended to be tougher and stronger. In addition, the researchers found replacing the aciniform silk c-terminal domains with c-terminal domains from other types of spider silk also improved fiber formation. The findings suggested that the c-terminal domain could potentially be manipulated to adjust the strength and toughness of the fibers. "Now we know that C-terminal domains are interchangeable," said researcher Lingling Xu. "This could be useful when we encounter expression problems while producing recombinant spidroins. For example, we could choose a C-terminal domain that has a better protein expression level, solubility or stability." Artificial spider silk remains far from commercially viable, but advances in understanding of the relationship between spider silk's structure and its function are helping scientists inch closer to creating an alternative in the lab. "Our future goal is to synthesize fibers with tunable mechanical properties based on our knowledge of the role of each domain," said Xu.